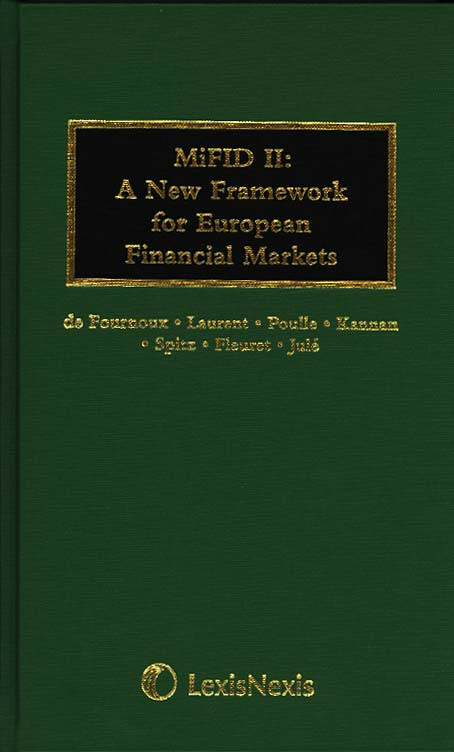 Available for the first time in English, MiFID II: A New Framework for European Financial Markets is the definitive work on this crucial reform and its global impact. It provides a clear and concise guide to understanding - and complying with - the most complex and wide-ranging reform of European financial regulation in recent times. E. de Fournoux, P. Laurent, F. Fleuret and B. Julé of AMAFi (Association francaise des marche financiers, Frances representative body for professionals in the securities industry and financial markets) were heavily involved in the drafting and implementation of the MiFID regulations. The partners of Spitz Poulle Kannan (Paris only law firm founded exclusively to provide advice on financial regulation and services), ensure that the text offers unrivalled expert guidance. "I can only hail the publication of a work which summarises the principal elements of this reform, above all when it is produced by acknowledged professionals. The authors deserve thanks for contributing in such an incisive way to highlighting a dense, complex and decisive reform for the future of European financial markets"
From the foreword by Markus Ferber, MEP and the European Parliament's Rapporteur for the Recast of the Markets in Financial Instruments Directive (MiFID II). Emmanuel de Fournoux, Pauline Laurent, Jean-Baptiste Poulle, Arut Kannan, Nicolas Spitz, Faustine Fleuret, Blandine Julé.